For the Disney animated series, see Hercules (1998 TV series). Hercules: The Legendary Journeys is an American television series filmed in New Zealand, based on the tales of the classical Greek culture hero Heracles (Hercules was his Roman analogue). It was produced from January 16, 1995 to November 22, 1999. It ran for six seasons, producing action figures and other memorabilia as it became one of the highest rated syndicated television shows in the world at that time. It has aired on Once Channel, Sky1, five/5 and Horror. It was preceded by several TV movies with the same major characters in 1994 as part of Universal Television's Action Pack in order of appearance: Hercules and the Amazon Women, Hercules and the Lost Kingdom, Hercules and the Circle of Fire, Hercules in the Underworld, and Hercules in the Maze of the Minotaur, the last of which served mostly as a "clip show" of the previous movies as a lead up to the series. The show was cancelled midway through filming of the sixth season, and only a total of eight episodes were produced after Kevin Sorbo initially declined to renew a three-year extension contract to continue his role as Hercules. The series is set in a fantasy version of ancient Greece not precisely located in historical time. Although set in ancient Greece, the show also has a mixture of Oriental, Egyptian and Medieval elements in various episodes. The show stars Kevin Sorbo as Hercules and regularly features Michael Hurst as his sidekick Iolaus. Rotating as Hercules' other regular companion, particularly in earlier seasons, is Salmoneus (Robert Trebor), a wheeler-dealer ever looking to make a quick dinar. Typical plot lines involve Hercules and Iolaus saving rustic villagers from monsters, evil warlords, or the often selfish whims of the gods. There was also comedy and episodes often had "in-jokes" about modern themes. In the earlier episodes as mentioned in the show's opening title, Hercules' main nemesis is his evil stepmother Hera, the powerful queen of the gods who seeks to destroy Hercules using various monsters and helping her various followers because he is a reminder of her husband Zeus' infidelity. As the series progressed, a wider range of enemies was used; notably Hercules' half-brother, the malicious god of war Ares replaced Hera as the show's primary antagonist. Towards the end of the series, Ares is himself replaced by the evil god Dahak who is the main villain in the show's fifth season and sets off a story arc that has Hercules traveling to Sumeria, Norseland and Éire. Although Zeus, Hercules' father, is frequently cited by Hercules as a neglectful father, Zeus' love for Hercules is well documented in the show. Indeed, Hercules is often referred to as "the favorite son of Zeus". Zeus makes several appearances on the show, even saving his son's life and restoring his superhuman strength on one occasion when he needs it the most. Hercules, for his own part, is always there for Zeus when his father needs him, and in the end, Hercules reconciles with his father and buries whatever issues he has with the father he has come to understand and love. Zeus (Roy Dotrice, Peter Vere-Jones, Charles Keating, Anthony Quinn). The show had two spin-offs, Xena: Warrior Princess and Young Hercules, with which it shared recurring characters such as Ares (Kevin Smith), Autolycus (Bruce Campbell), Salmoneus (Robert Trebor), Aphrodite (Alexandra Tydings), Deimos/Strife (Joel Tobeck) and Callisto (Hudson Leick). Both shows, although produced in New Zealand with mostly local actors using American accents, were syndicated worldwide. Anchor Bay Entertainment released all 6 Seasons of Hercules: The Legendary Journeys on DVD in Region 1 for the first time between 2003-2005. As of 2010, these releases have now been discontinued and are out of print. 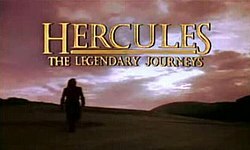 On January 12, 2010, Universal Studios Home Entertainment announced that they planned on re-releasing Hercules: The Legendary Journeys on DVD. They have subsequently re-released all six seasons. In Region 4, Madman Entertainment has released all 6 seasons on DVD in Australia. NOTE: The Season 1 release in both regions 1 & 4 includes the 5 tele-films preceding the series. The region 1 re-release does not include the TV movies. Hercules: The Legendary Journeys is an action adventure video game with beat 'em up elements that was released on the Nintendo 64 and Game Boy Color, developed by Player 1 and published by Titus Interactive, based on the television series. The success of the show also saw a number of similar ancient-set series being commissioned, such as The Adventures of Sinbad, Conan the Adventurer, The New Adventures of Robin Hood, BeastMaster, Tarzan: The Epic Adventures, and Jack of All Trades. A sci-fi series, Cleopatra 2525, was also produced as a result of the series' influence. Thirteen years later, Legend of the Seeker was produced by the same team. ^ "Research Hercules: the Legendary Journeys". BookRags.com. 2010-11-02. Retrieved 2013-11-01. ^ "Kevin Sorbo interview". 2007-10-09. Retrieved 2015-02-13. ^ "Buy Hercules: The Legendary Journeys - Season 1 (7 Disc Box Set) on DVD-Video from". EzyDVD.com.au. Archived from the original on 2010-02-01. Retrieved 2013-11-01. ^ "Buy Hercules: The Legendary Journeys - Season 2 (7 Disc Box Set) on DVD-Video from". EzyDVD.com.au. Archived from the original on 2010-03-04. Retrieved 2013-11-01. ^ "Buy Hercules: The Legendary Journeys - Season 3 (7 Disc Box Set) on DVD-Video from". EzyDVD.com.au. Archived from the original on 2012-07-29. Retrieved 2013-11-01. ^ "Buy Hercules: The Legendary Journeys - Season 4 (7 Disc Box Set) on DVD-Video from". EzyDVD.com.au. Archived from the original on 2010-09-16. Retrieved 2013-11-01. ^ "Buy Hercules: The Legendary Journeys - The Final Seasons: Season 5 & 6 (10 Disc Box Set) on DVD-Video from". EzyDVD.com.au. Archived from the original on 2010-11-15. Retrieved 2013-11-01. ^ "Hercules: The Legendary Journeys Release Information for Nintendo 64 - GameFAQs". www.gamefaqs.com.